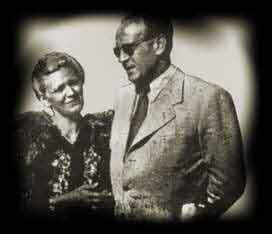 Emilie Schindler's husband Oscar Schindler became a household name as one of the great humanitarians of the century, saving 1,300 Jews from certain death in the Nazi death camps during World War II. While Oscar Schindler's efforts to save hundreds of Jews are well known thanks to Keneally's book and the movie Schindler's List, the silver-screen version left Emilie on the sidelines. Now a new German-language book Ich, Emilie Schindler by the Argentinian author Erika Rosenberg tries to show that Emilie was just as involved in shielding Jews from the Nazis. The biography highlights Emilie Schindler's bravery during the Holocaust and portrays her not only as a strong woman working alongside her husband but as a heroine in her own right. Emilie Pelzl was born on October 22, 1907, in the city of Alt Moletein, a village in the German-populated border region of what was then The Republic of Czechoslovakia. Emilie later recalled the local pastor, an old family friend, who instructed young Emilie to end her friendship with a young Jew, Rita Reif. Emilie defied the pastor and retained her friendship with Rita, until Rita was murdered by the Nazis in front of her father's store in 1942. In spite of his flaws, Oscar had a big heart and was always ready to help whoever was in need. He was affable, kind, extremely generous and charitable, but at the same time, not mature at all. He constantly lied and deceived me, and later returned feeling sorry, like a boy caught in mischief, asking to be forgiven one more time - and then we would start all over again. In the thirties, now without employment, Oscar Schindler joined the Nazi party, as did many others at that time. He had seen the possibilities which the war brought in its wake, and he followed on the heels of the SS when the Germans invaded Poland. He left Emilie in Zwittau and moved to Kraków, where he took over a Jewish family`s apartment. Bribes in the shape of money and illegal black market goods flowed copiously from Schindler and gave him control of a Jewish-owned enameled-goods factory, Deutsch Emailwaren Fabrik, close to the Jewish ghetto. Schindler principally employed Jewish workers. At this time, they were the cheapest labour. Schindler promised the Jews who worked for him that they would never starve, that he would protect them as best he could. And he did, building his own workers barracks on the factory grounds to help alleviate the sufferings of life in the nearby Plaszow labor camp. He gave safe haven to as many Jewish workers as possible, insisting to the occupying Nazis that they were "essential workers", a status that kept them away from harassment and killings. At Schindler`s factory, nobody was hit, nobody murdered, nobody sent to death camps. But conditions at the factory were far from comfortable. Freezing, lice-ridden inmates still suffered typhus and dysentery. Until the liberation of spring, 1945, the Schindler's used all means at their disposal to ensure the safety of the Schindler-Jews. They spent every pfennig they had, and Emilie's jewels were sold, to buy food, clothes, and medicine. They set up a secret sanatorium in the factory with medical equipment purchased on the black market. Here Emilie looked after the sick. Those who did not survive were given a fitting Jewish burial in a hidden graveyard - established and paid for by the Schindlers. Later accounts have revealed that the Schindlers spent something like 4 million German marks keeping their Jews out of the death camps - an enormous sum of money for those times. The factory continued to produce shells for the German Wehrmacht for 7 months. In all that time not one usable shell was produced; none passed the military quality tests. We found the railroad car bolts frozen solid .. the spectacle I saw was a nightmare almost beyond imagination. It was impossible to distinguish the men from the women: they were all so emaciated - weighing under seventy pounds most of them, they looked like skeletons. Their eyes were shining like glowing coals in the dark ..
Of the 250 in the wagons, thirteen were dead. Throughout that night and for many nights following, Emilie worked tirelessly to rehabilitate these Jews. One large room in the factory was emptied for the purpose. Three more men died, but with care, the others gradually rallied. Today, surviving Schindler-Jews remember how Emilie worked indefatigably to secure food and somehow managed to provide the sick with extra nourishment and apples. A Jewish boy, Lew Feigenbaum, broke his eyeglasses and stopped Emilie in the factory and told her: "I broke my glasses and can't see .." When the Schindler-Jews were transferred to Brunnlitz, Emilie arranged for a prescription for the eyeglasses to be picked up in Kraków and delivered to her in Brunnlitz. As long as I live, I will always have a sincere and eternal gratitude for dear Emilie. I think she triumphed over danger because of her courage, intelligence and determination to do the right and humane thing. She had immense energy and she was like a mother. She got a whole truck of bread from somewhere on the black market. They called me to unload it. She was talking to the SS and because of the way she turned around and talked, I could slip a loaf under my shirt. I saw she did this on purpose. A loaf of bread at that point was gold .. There is an old expression: Behind the man, there is the woman, and I believe she was the great human being. In May, 1945, it was all over. The Russians moved into Brunnlitz. The previous evening, Schindler gathered everyone together in the factory, where he and Emilie took a deeply emotional leave of them. The Schindlers - and the 1300 Schindler-Jews - had survived. Oscar Schindler`s life after the war was a long series of failures. He tried without success to be a film producer and was deprived of his nationality immediately after the war. Threats from former Nazis meant that he felt insecure in post-war Germany, and he applied for an entry permit to the United States. He was refused as he had been a member of the Nazi party. After this he fled to Buenos Aires in Argentina with Emilie, his mistress, and a dozen Schindler Jews. The Schindlers settled down in 1949 as farmers, first raising chickens and then nutrias. They were supported financially by the Jewish organization, Joint, and other thankful Jews. But Oscar Schindler met with no success, and in 1957 he became bankrupt and travelled back alone to Germany, where he remained estranged from his wife for 17 years before he died in poverty in 1974, at the age of 66. He never saw Emilie again. Emilie stayed in Argentina, where she scraped by on a small pension from Israel and a $650 a month pension from Germany. Her only relative, a niece, lived in Bavaria, Germany. In May, 1994, Emilie Schindler received The Righteous Amongst the Nations Award. In 1995, Argentina decorated her with the Order of May, the highest honor given to foreigners who are not heads of state. In 1998, the Argentine government decided to give her a pension of $1,000 a month until her financial situation improved. She was named an Illustrious Citizen by Argentina. In July, 2001, during a visit to Berlin, Germany, a frail Emilie handed over documents related to her husband to a museum. Emilie Schindler died Friday night October 5, 2001, in a Berlin hospital. "At last we meet again .. I have received no answer, my dear, I do not know why you abandoned me .. But what not even your death or my old age can change is that we are still married, this is how we are before God. I have forgiven you everything, everything .. "